Drain the beans. Set aside 1/4 cup of the beans. Place remaining beans, garlic, sea salt, lemon juice and basil in a mixing bowl and mash with a potato masher. Mix in the reserved beans. Remove and pour into a serving dish. Slice the baquette into 16 pieces and place on a baking sheet. Drizzle or brush a little olive oil over and broil about 3 minutes until slightly brown. Remove and set aside. Heat olive oil in a skillet and sauté the spinach for 2 to 3 minutes until wilted and dark green. Remove and place on a plate. 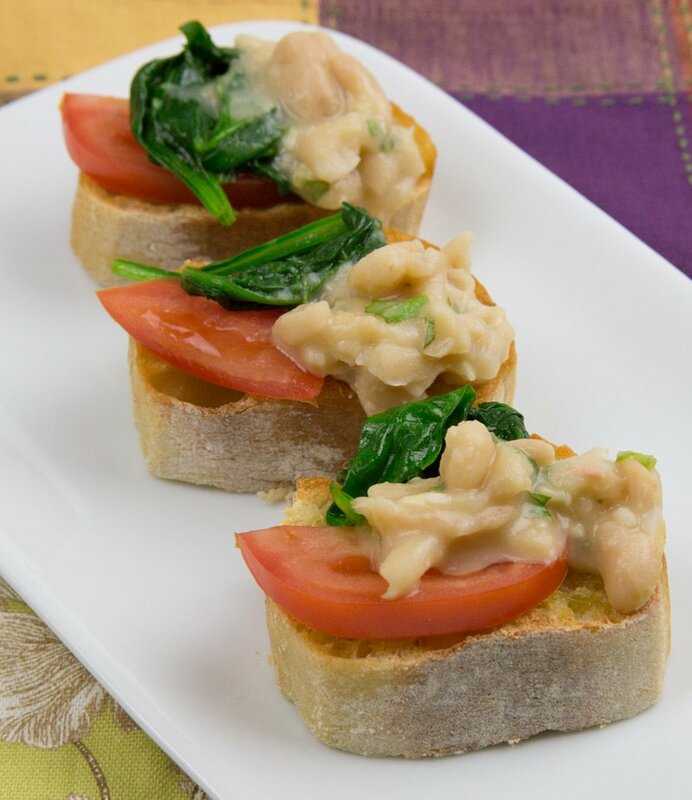 Place 2 or 3 spinach leaves, a slice of tomato, and a tablespoon or so of bean spread on each slice of bread. Arrange on a platter and serve.